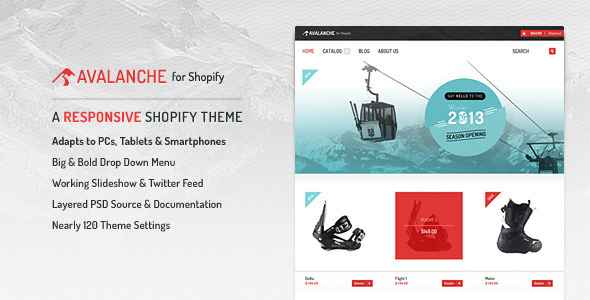 Avalanche for Shopify is a responsive shopping cart theme written in HTML5 / CSS3, which provides a convenient way for your customers to buy your products at home or on the go and which seamlessly adapts to your customers screen sizes no matter if they use a desktop pc, a tablet or a smartphone to view your site. Even though a detailed documentation has been included for your convenience, you can of course always send me an email to hello@indiqo.eu or leave a comment whenever you should have some kind of question, need my help or maybe got a suggestion how to improve this theme even further. Any kind of feedback is appreciated and I usually try to answer to your requests within 24 hours, but most of the time even faster, so don’t hesitate to contact me at any time!